In the desire to achieve a better work/life balance, more and more of us are working from home. But how can you improve your levels of creativity, happiness and productivity when working from a home office? Simple: add some houseplants. There is a growing interiors trend to bring the outdoors in and not only can it create a beautiful, lush interior scheme, it can have health benefits, too, including the reduction of anxiety and stress, improving your sleep and boosting your mood. Research commissioned by Indoor Garden Design and Exeter University found that having houseplants in your home office environment can dramatically alter your morale. Results identified a 47% increase in overall wellbeing, a 45% increase in creativity and 38% boost in productivity where plants were present in the office. With this in mind, Indoor Garden Design and Ikea have partnered for Chelsea Flower Show 2018, running until 26 May, to present ‘Plants Work’. The open-plan home-office installation aims to educate visitors on how a range of houseplants can be used in the home office to provide a wide range of both physical and psychological health benefits. Indoor Garden Design's Ian Drummond explains how to include plants in your home workspace. 1. When considering where to place your plants in the home office, have them within your sight line. Try to ensure they are close to you and around your working space – ideally on your desk or a bookshelf nearby. 2. To stimulate your creativity and productivity the greener the plant, the more effective. Go for large varieties that a visually impactful, with dramatic leaves. Monstera Deliciosa is a great choice, as is Ficus Lyrata. 3. For plants that are easy to look after in low light and require little watering, try sanseveria, as they manage very well in a challenging environment. Zamioculcas is also excellent – both will thrive on neglect; it’s overwatering that will kill them! 4. 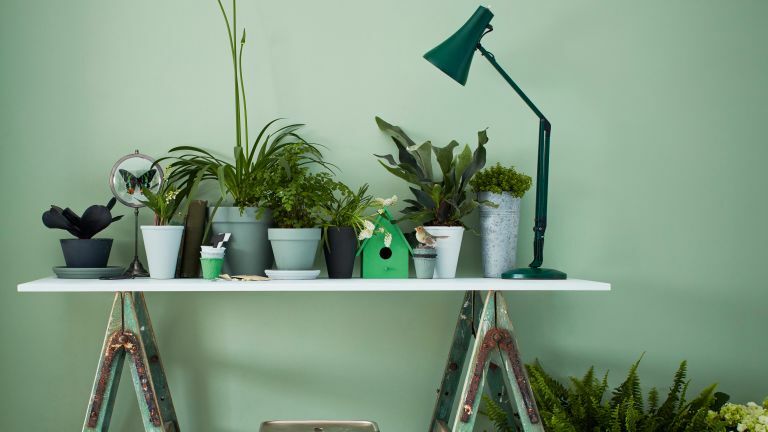 Mini plants - such as the sansevieria, cacti or mini orchids from the Ikea desktop plant range - are perfect if you have a really small work space. They are so versatile and a good option if you’re buying houseplants for the first time. 5. Having plants in the working environment is hugely beneficial, they clean the air by reducing harmful chemicals like formaldehyde and benzene, and they also provide a huge psychological boost. As human beings, we have an innate need to be connected with nature – it’s called biophilia and it’s essential for our overall health. 1. Houseplants can make an office feel more peaceful and alive. Cacti and succulents are easy to look after, so they’re great if you don’t have much time or are often away. A collection of 'cactus-scapes' creates drama, so have fun playing with different styles. 2. You don’t need green fingers to enjoy plants - the likes of monstera and geraniums almost take care of themselves. They’re a great way to start off without getting overwhelmed. 3. Consider mixing and matching your plant pots. You can completely change the look of your plants by changing their containers. For planters without a drainage hole, like tea/coffee cups and some ceramics, add a layer of gravel, lava rock or pot shards on the bottom to prevent root rot.